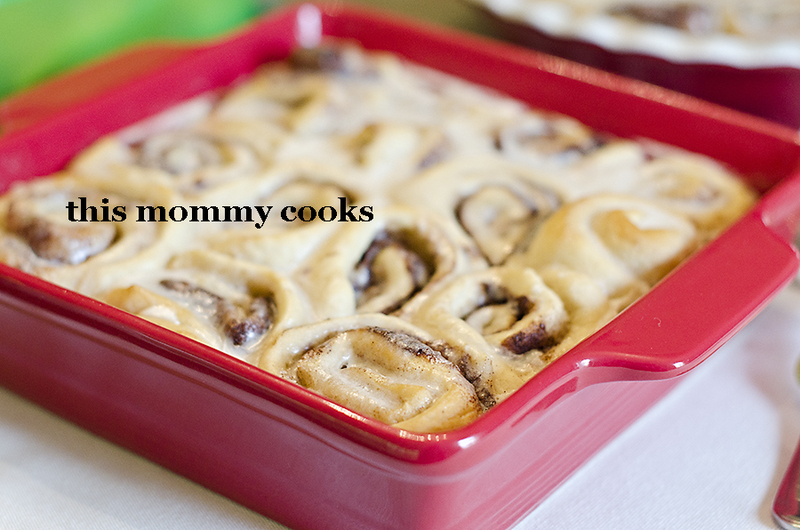 Love cinnamon rolls but don't love having to wait all day on making the dough? Try out this quick rise dough and you'll have hot, fresh cinnamon rolls in just under an hour, or less if you're faster than me! I used this dough to make rolls on Easter, blog post coming soon, and they took about 30 minutes to make. It was so great to be able to have fresh bread so fast. I thought making quick(er) cinnamon rolls would be amazing too, so I put the same dough to work with them and they were amazing. So many compliments! Give these a try, they aren't as hard as they seem, and so worth it when your mouth bites into the gooey sweetness that these rolls are! In the bowl of a stand mixer, combine warm water, oil, yeast and sugar; let rest for 5-10 minutes or until frothy and bubbly. With a dough hook, mix in salt, egg and 2 cups of flour until combined. Add remaining 1/2 cup flour at a time. It should come together like a ball, dough will be sticky but it shouldn't be too sticky. If it is too sticky, add additional flour, about two tablespoons at a time. Lightly flour or grease countertop or roll mat. I sprayed my roll mat with non stick spray it worked perfectly! Roll dough out into a large rectangle. To make the filling, pour melted butter over the surface of the dough and spread with hands, spoon, or basting brush so the butter covers the dough evenly. Generously sprinkle the ground cinnamon and sugar over the butter. Now, beginning at the end farthest from you, roll the rectangle tightly toward you. Use both hands and work slowly, being careful to keep the roll tight. This is the tough part. Butter and sugar might start oozing out of the sides, but keep rolling. When you reach the end, pinch the seam together. When you're finished, you will have a long dough "log." Transfer to a cutting board and with a sharp knife, make 1 to 1-1/2 inch slices. Place the sliced rolls in the pans that have been sprayed with nonstick spray, being careful not to overcrowd. Set aside to rise on the counter top for 10-15 minutes minutes before baking. Bake for 13 to 17 minutes, until golden brown in preheated oven. Don't allow the rolls to become overly brown. While the rolls are baking, make the maple icing. In a large bowl, whisk together the powdered sugar, milk, butter, coffee, and salt. Add in the maple syrup. Whisk until very smooth. The icing should be thick, but still pourable. While the rolls are still warm, generously drizzle icing over the top. Be sure to get it all around the edges and over the top. As they sit, the rolls with absorb some of the icing's moisture and flavor. Made these this weekend, they were a huge hit and quite fast! I'm so glad they were a hit Alison! !